A Roman Catholic cemetery in Belfast featuring a Victorian Romanesque gateway, biblical scenes and large Celtic cross. The significant graveyard is a symbol of revered leaders that were buried here. The memorials are very impressive and will take you back to the historic time of the city. 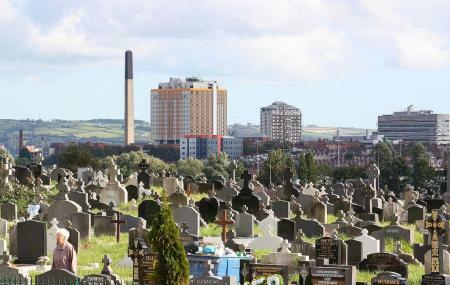 The cemetery is a recommended visit when in the city of Belfast. Timings may vary with season. The office is open from 8.30am to 5pm (Monday to Thursday) and 8.30am to 4.30pm (Friday). How popular is Milltown Cemetery? People normally club together Dunmurry Golf Club and Botanic Gardens while planning their visit to Milltown Cemetery. Beautifully kept cemetery, you could spend hours going round the graves of so many brave woman and men of Ireland.. athal O’Byrne was an Irish singer, poet and writer. He joined the Gaelic League in Belfast and became a popular singer and storyteller. He was a stage manager of the ulster Theater and would even become involved with the IRA, likely a member of the military council. In 1921 O’Byrne travelled to America as a freelance journalist and opened a bookstore. He would return to Ireland after raising $100,000 for victims of the Belfast riots through White Cross. He was a devout Catholic and even interviewed the Pope. Known for his dandified dress style, Cathal remained a bachelor his entire life. O’Byrne suffered from a stroke one month before his death on 1 August 1957. He is remembered as an important figure in the Celtic revival in the North of Ireland. Charles Patrick “Charlie” Tully was a famous footballer of Celtic Football Club and Belfast Celtic. Charlie’s skill quickly earned him the reputation as a Celtic great after an outstanding performance against Rangers in a 3-1 victory at Celtic Park where it was reported ‘Tully dribbled about almost at will.’ ‘..The miraculous Irishman bewildered, badgered…. mesmerised Rangers..’ This catapulted Tully to the status of cult hero and the beginning of ‘Tully Mania’ when Tully cocktails were sold in pubs; Tully ties in shops and green Tully ice cream in cafes. He is hailed as one of Celtic’s best ever players. A must see peaceful cemetery well worth a walk around. There are so many things to learn and see here you could spend hours just walking around see all the memorial. The cemetery has come along way and is beautiful now opens till 4pm. Our deceased are at the back where the old trees and hedges have been removed well presented and very easy to find now.